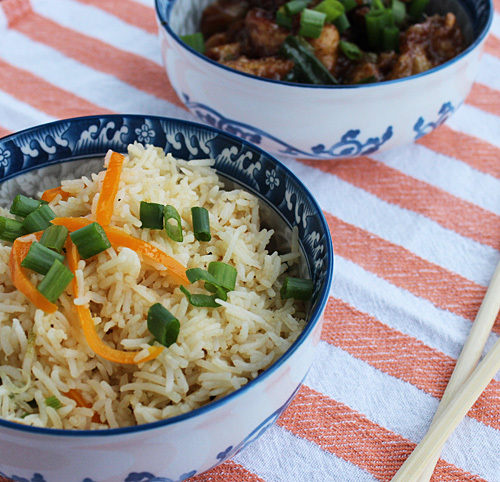 Orange Chicken with Orange Bell pepper Fried Rice! Every time I walk past a Chinese Fast Food Joint in a mall, the vendors would usually call out and offer free tasting bites of Orange Chicken. I had never tasted a version of Orange Chicken in India or Malaysia so i assumed its a local favorite in North America. Finally i discovered this food craze was created by Panda Express and Orange Chicken is one of their signature meals. I love the fruity flavors orange imparts to chicken. The closest resemblance we enjoy in India is sweet and sour chicken made with pineapple juice and tomato ketchup. 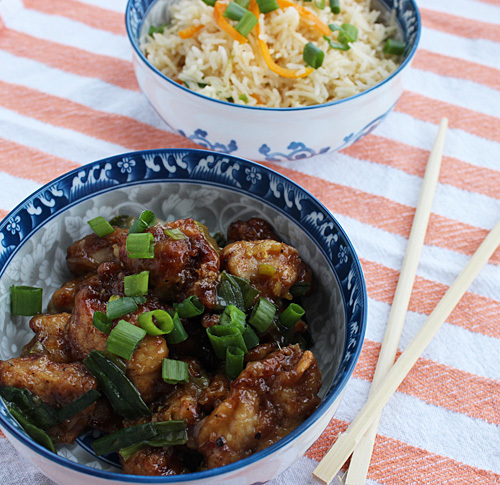 I decided to try this orange chicken at home and found plenty of resources online. Its a very simple recipe which i have adapted to make egg free, corn free and gluten free. First marinate the chicken and keep aside for at least 15-20 minutes. Mix all the ingredients of orange sauce and taste to balance the sweet, spicy and tangy flavors. Heat oil in a wok/saucepan to high to fry the chicken. In a plate mix the rice flour and tapioca starch. Lightly coat each chicken piece with this flour. Reduce heat to medium and fry the chicken pieces till they are almost cooked and lightly browned. Remove with slotted spoon on to a kitchen towel. In another saucepan/wok heat the sesame oil to medium. Add the ginger, garlic and spring onions and saute till lightly browned. 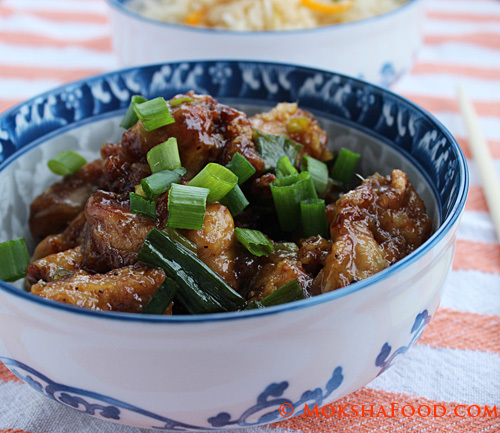 Stir in the fried chicken pieces and mix well to coat each piece with the sauce. I serve this homemade allergen free Orange Chicken over a bed of Orange bell pepper fried rice .